Just to check the pulse of America and see how things are trending, let’s take a look at what Americans are reading. Liberty and Tyranny: A Conservative Manifesto by Mark Levin is currently holds the #1 position in sales ranking for all books at Amazon.com. The 5000 Year Leap: A Miracle That Changed the World is a very respectable #19 in the Amazon sales ranking. Liberal Fascism: The Secret History of the American Left, From Mussolini to the Politics of Meaning comes out in Paperback in June. I’m expecting a jump in sales then. Kristin Tant is a single mom and a small business owner. She has a few things to say to our Dear Leader. Massachusetts Legislature to Citizens: Screw You. In state well know for out of control government spending, corruption, and general inefficiency, our completely out of touch reality and massively democrat majority legislature has decided to raise the sales tax from 5% to 6.25%. Even our clueless “Cadillac of Governors” has figured out that this is a bad idea and threated to veto it. So his democrat allies in the State House responded by passing the bill with a veto proof majority. Specter said then- Vermont Sen. Jim Jeffords’ decision to become an independent was disruptive to the functioning of Congress. He proposed a rule forbidding party switches that had the effect of vaulting the minority to majority status in the middle of a congressional session. The bottom line is that Spector looked at the polls for the Republican Primary in Pennsylvania and saw that he was going to loose big time. Given that Pennsylvania went for our Dear Leader in 2008, and that most of those votes came out of Spector’s base of Philadelphia, he decided that he had a better change of re-election as a democrat in the general election. Arlen Spector’s party switch isn’t about Republican or democrat policies. It’s all about Arlen Spector. Update: Spector’s switch isn’t being praised by everybody on the left. Rachel Maddow is now calling him a DINO. Bloody fornicating brilliant. I’m betting she wrote this herself. A slightly different hero than the genre usally sees in this modern day horror/adventure tale by NY Times best selling author John Ringo. Barbara Everett is a Christian soccer mom from the southeastern United States. Who just happens to an expert in martial arts and combat shooting. Which comes in handy when Lovecraftian evil comes a calling on her quiet vacation spot. This book is actually a collection of several stories, including one that takes place mostly at a SciFi/Fantasy con. A lot of industry inside baseball in that one, which makes it way cool. A warning to AGW cultists, actual science is used in video below to dispute Al Gore’s fear mongering. Remember kids, Al Gore founded a company that sells “Carbon Credits.” Those are modern plenary indulgence payments to the AGW Cult the gullible make. Even the New York Times calls the practice a scam. If you are wondering why someone like Al Gore, former Senator and former Vice-President of the United States of America, is participating in an obvious scam based on junk science, I suggest you follow the advice of the man who wrote the screen play. Update: Al Gore Lies to Congress. What else did he lie about? 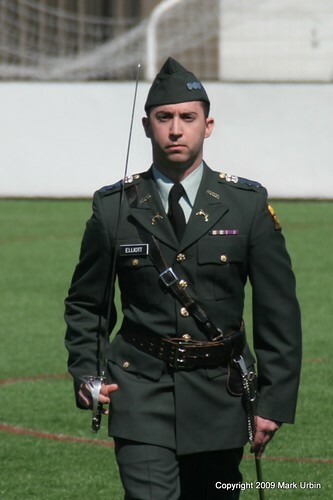 I was at the Boston University Tri-Service ROTC Pass in Review ceremony yesterday and got a lot of great photographs. Here is one that I think came out quite well. This photo is also posted on the Slices of Life Photography Blog. There are more photographs of this event at Urbin Photography. Update: November 3, 2009, I’ve learned that there is an ad on Facebook using this photograph, without my knowledge or permission, and with my copyright notice clearly cropped off. If you see this add on Facebook, could you please flag it as a copyright violation and send me a screenshot of it. A step down from the luxury ride of the Tesla Type S Sedan is the Aptera, a compact sized electric car, which looks like it just rolled off a SciFi movie set. The first sales will be limited to California, and then Florida and Texas. Seriously, I don’t see this thing being able to handle a New England winter. From 1987 comes this comic tribute to the 1950s television show. Staring Dan Aykroyd as the original Joe Friday’s nephew and Tom Hanks as his partner Pep Streebek.